a text-based interpreter to control a model from a command prompt. 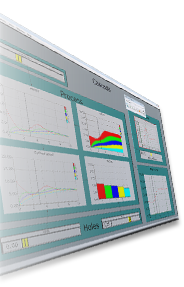 To run a stand-alone MyM model it requires no other software, not even the MyM package itself. 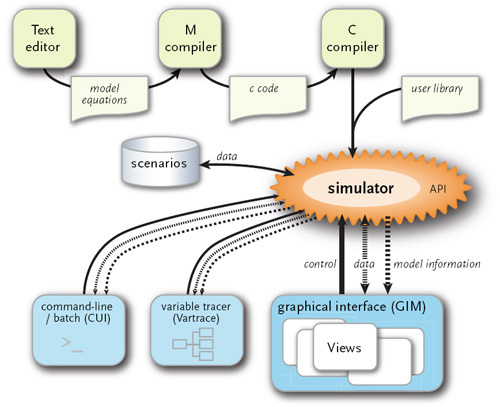 To create or edit models one needs the MyM package, a text editor that can generate plain ASCII and a properly installed ANSI-C compiler Visual C++ 8. The later is needed to generate an executable from the C code into which MyM translates the set of equations making up an M model. No knowledge about the C compiler is needed to use MyM. We have used the Visual Studio 2005 compiler under Windows. Versions for this compiler and other compilers will become available, other compilers may require minor modifications to the make files and in the environment settings at installation time. To use the MyM development package, one needs a PC running Windows. Versions for Linux and OSX will be available in the near future. Hardware requirements depend mainly on the size of the models to be developed, MyM itself requires 100 MB disk space. Hardcopy requires a printer. On-line documentation (user and system) is based on HTML and Pdf.